Dvd one piece - part 2 - limited edition (box 33 dvd). Product DescriptionThis 2nd limited edition limited edition box contains episodes 196 to 325 of the tv series. The adventures of luffy with straw hat and his companions continue. After having conquered energetic on the celestial islands, they descend again on big line to continue their journey. Only powerful enemies are waiting for them on the way, from foxy to CP9 via Admiral Aokiji, the pirates will have to fight to get to the one room. Box 33 dvd - part 2 - 130 episodes - 3250 min - vf + vost-fr / nl additional content: - pencil galleries - generessessynopsis the adventures of luffy with straw hat and his companions continue. Only powerful enemies are waiting for them on the way, from foxy to CP9 through the admiral aokiji, the pirates will have to fight to get to one piece. 130 episodesconstructors: eiichirô oda, kônosuke uda, hiroaki miyamoto, tôei animationformat: palaudio: french, japanese, dutch region: region 2 this dvd will probably not be able to be viewed outside europe. Number of discs: 33studio: kana home videodate output of the dvd: July 18, 2017 duration: 3250 minutes. 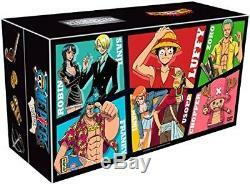 Product Description this 2nd one-piece limited edition box contains episodes 196 to 325 of the tv series. Box 33 dvd - part 2 - 130 episodes - 3250 min - vf + vost-fr / nl additional content: - pencil galleries - generic synopsis the adventures of luffy with straw hat and his companions continue. 130 director episodes: eiichirô oda, kônosuke uda, hiroaki miyamoto, tôei animation format: pal audio: french, japanese, dutch region: region 2 this dvd will probably not be able to be viewed outside europe. Number of discs: 33 studio: kana home video dvd release date: July 18, 2017 length: 3250 minutes. We do not deliver post boxes or military bases, thank you to take into account when ordering. Followed letter - 0.00. Post - international economic mail - 7.90. For more information on delivery, click on more info. Sorry, our products are not available for withdrawal in store. On request, we offer the possibility to pay by bank transfer. No checks will be accepted. The law n 81-766 of August 10, 1981 relative to the price of the book, known as law lang (of the name of jack lang, minister of the culture), is a law establishing a unique price of the book in France. Ask the seller a question. Manga - academy alice (the) vol. Manga - princess sakura vol. Manga - nijika, dream actress, tome 3. Manga - nijika, dream actress, tome 5. To contact the customer service, simply click on the button and we will be happy to assist you. Delivery is free for this item (metropolitan France only). Upon request, we accept payment by transfer. The object must be returned within 14 days after receipt. The buyer pays the return costs. Returns are possible for 14 days after receipt of your order. The return costs are the responsibility of the buyer. For an object to be returned, it must be in the same condition as when it was received, the packaging must be present and in good condition (not torn), all parts, accessories and notices must be included in the return. Please note that according to the regulations in force, the right of withdrawal can not be exercised for customizable books, audio recordings, video or computer software unsealed by the customer ..
books will not be resumed if they show traces folds, pages cornea, writing .. the item "dvd one piece part 2 limited edition (box 33 dvd)" is on sale since Sunday, October 1, 2017. It is in the category "dvd, cinema \ dvd, blu ray ". The seller is "around_the_clock" and is located in /leans. This item can be shipped to the following country: europe.